One component, polyurethane based, flexible joint filler. It is highly durable to snow and sun and does not grease surfaces, while it presents high mechanical strengths. Unaffected by sea (salt) or fresh water, it is paintable and is effective for sealing joints of 6-30mm wide and of 3-15mm deep. 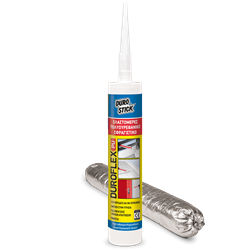 Indispensable for any demanding sealing application, such as sealing expansion joints in terraces, sealing around window and door frames made of aluminum, metal, PVC and wood, as well as sealing junction between vertical and horizontal surfaces. Necessary for sealing metal and wood rails, at their penetration (contact) points with marble, natural stone or concrete slabs on roofs, as well as balconies and walls etc. Another use of the product is for sealing dissimilar materials such as stone and plaster or concrete, polyester, stainless steel etc. Ensure excellent adhesion on porous surfaces by priming with PRIMER-PU. Indicatively, one 310ml cartridge fills 8,6 linear meters of a 6x6mm joint.